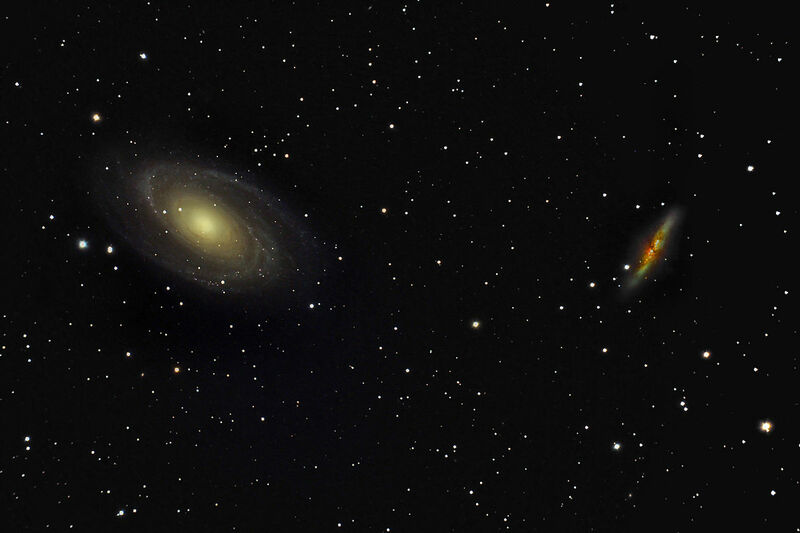 Here is your weekly reminder of Psalm 19 — the galaxy pair, M81 and M82. This galaxy pair is part of the M81 group, a collection of 34 galaxies that are all gravitationally bound to each other. These two galaxies (click the image to enlarge it) are particularly strongly attracted to each other, which has triggered some extreme activity in both. The spiral galaxy on the left is M81, and is also referred to as Bode’s Galaxy, after J.E. Bode, who discovered it in the 18th century. Bode’s Galaxy has an active black hole in its center weighing in at 70 million times the mass of the Sun. The gigantic black hole is feeding on gaseous material that has spiraled down to the center of the galaxy, which causes it to shine very brightly. The galaxy on the right is M82, and is sometimes called the Cigar Galaxy because of its cigar-like shape, which is due to its gravitational interaction with M81. This interaction has triggered massive star formation in M82. The galaxy pair appears in the Ursa Major constellation, and is relatively nearby at 12 million light-years away, making it a favorite of both professional and amateur astronomers. The M81 Group is a neighbor to the Local Group, which contains the Milky Way, and the two groups are part of the much larger Virgo Supercluster of galaxies.